Let this bright red metal coat rack enhance your home with excellent functionality. beautiful finial adds a touch of class to this fashionable coat rack. This is an elegant 6 shelf rack. It is made of dark brown with highlights hand stained, cross-hatch heat pressed wood treatments. Made of dark brown with highlights hand stained, cross-hatch heat pressed wood treatments. Free standing 6 shelves rack, is reliably constructed and multipurpose suitable for any room in your home. This is an open shelving for storage and display. Brought to you by ArtMaison Canada. 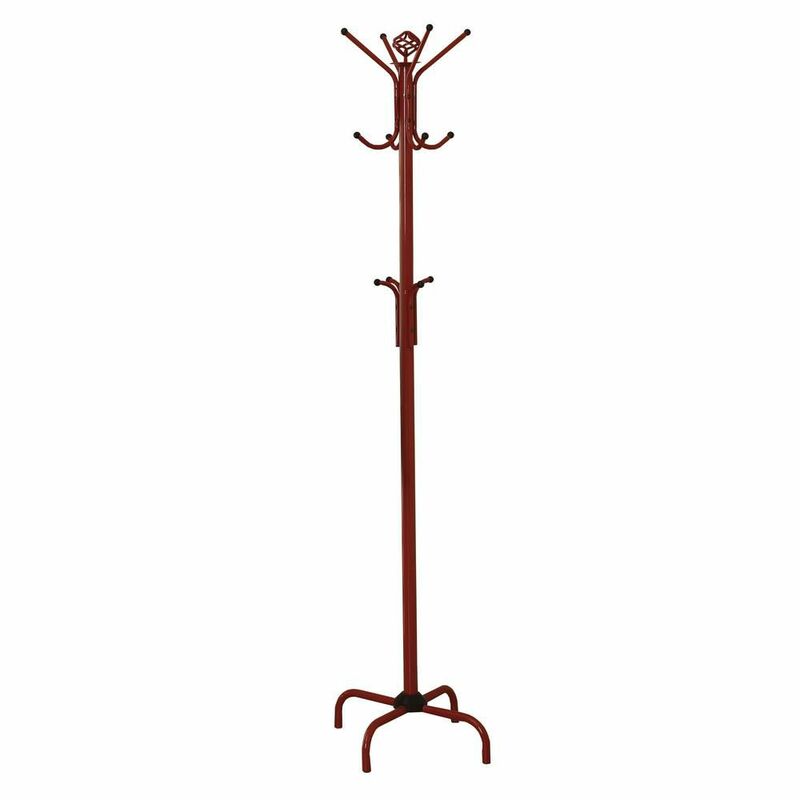 Coat Rack - 70"H / Red Metal Let this bright red metal coat rack enhance your home with excellent functionality. There is plenty coat, hat, glove and umbrella storage with 2 tiers of hooks. A beautiful finial adds a touch of class to this fashionable coat rack. Coat Rack - 70"H / Red Metal is rated 4.3 out of 5 by 8. Rated 5 out of 5 by Judy from It is exactly what I wanted and my husband had... It is exactly what I wanted and my husband had no problems putting it together. Does a great job. Rated 3 out of 5 by Henritta67 from Coat rack not very sturdy. Bought it a couple months ago color was different from what I ordered, but was not that important. Rated 5 out of 5 by Buyer from Works like it should Recently bought this item; it's nice and tall and has many (12) hooks for your things. The photo makes the red look dark like a maroon colour but it's actually a bright scarlet red so beware. I'm not a fan of the bright red but my things cover most of the rack so it's okay! Rated 4 out of 5 by Meg1 from Quite sturdy! Very affordable Some plastic parts I didn’t love- but other than that great! Rated 4 out of 5 by Sandy from Attractive look, strong! It does have table leg syndrome, where one leg doesn't quite touch the f... Attractive look, strong! It does have table leg syndrome, where one leg doesn't quite touch the floor! Serves its purpose!